The business climate turned sharply colder in Russia during the second half of 2003, and it’s not gotten much better in these first few months of this year. But a second-term Putin is unlikely to jettison the reform project entirely. When Russia’s population voted Vladimir Putin back into power in mid-March, they were voting above all for certainty. But for those engaged in business in Russia, certainty is a scarce commodity. Since the summer of 2003 a war against key shareholders in the giant oil group Yukos had unsettled investors, tied as it was to ever-louder grumblings that Russia’s thriving hydrocarbon and metals tycoons would be asked to contribute more of their wealth to the greater national good. 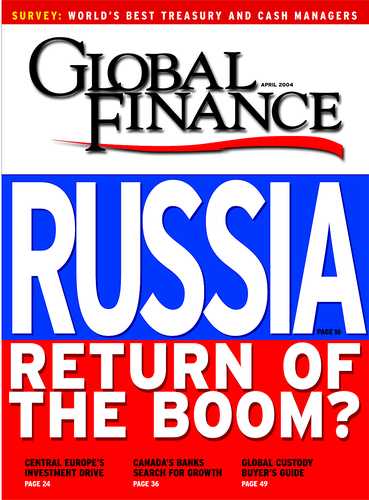 A March 2004 poll by the All-Russian Center for Public Opinion Studies made it clear that most Russians viewed the fight against poverty as the key task facing the country— and redistribution rather than economic growth alone was the preferred method.As detailed in Global Finance in January 2004, tax is the key public battlefield. Slapping Russia’s hydrocarbon giants with hefty tax bills allows the Kremlin to remind the oligarchs who is boss, demonstrate to a restive populace that Putin is on the side of the little guy and—not insignificantly—provide the government with resources to pursue a second-term social agenda. The numbers involved are huge.The natural resources ministry estimates that oil companies are underpaying some $3 billion a year in taxes on profits. As a result there’s little sign of a let-up in the offensive. Early this year the finance ministry hit Yukos-Sibneft with a R98 billion ($3.5 billion) bill for unpaid taxes for the 2003 financial year. If paid, that would have wiped out the company’s earnings. Sticker shock like that is having its effect: Yukos’s chief rival Lukoil has announced it’s giving up tax-avoidance schemes. There is little doubt that under the next Putin term Russia’s leading companies will be unable to avoid paying higher rates on their earnings. But while tax is the Kremlin’s highest-profile method of bringing the oligarchs back into line, it’s by no means the only one— much to the chagrin of overseas investors looking to carve a slice of the action in Russia’s banner industries. In late January then deputy prime minister Viktor Khristenko tore up a decade-old agreement over exploration rights to Sakhalin 3, an oilfield off Russia’s northeast coastline. ExxonMobil and ChevronTexaco had already sunk up to $60 billion in the fields. Just three months later the atmosphere was very different. ExxonMobil’s Moscow point man Glenn Waller described January’s move by the government—now under appeal by the US oil majors—as “a violation of our property rights.”He argued it was likely to deter overseas investors. Russia’s Rosneft, partner to Exxon and Chevron in Sakhalin 4, is believed to be using its state-owned status to carve a bigger chunk of the country’s oil reserves. That’s a shrewd move: The belief that gas and oil are strategic resources over which the state should wield some power—whether direct or indirect—permeates much of the Russian political class.Yukos boss Mikhail Khodorkovsky’s downfall may have had as much to do with his desire to build private pipelines to direct Yukos products to China and the US as any overt political actions. International oil majors are still eyeing up stakes in Russia’s hydrocarbon giants—Roman Abramovich’s Sibneft holding is receiving the most attention right now— but any sale will more then ever have to have approval right from the top. With much of Russia’s banking system in the hands of high-profile businessmen with large industrial stakes, it’s little surprise that attention has focused most closely on the maneuverings for position in the country’s tangled economic and business landscape. But dig under the surface, and there is clear evidence that the country is developing many of the attributes of a modern economy—such as a functioning banking system. Russia’s citizens have traditionally taken a skeptical attitude toward banks, stashing their money offshore where they can and under the mattress if they can’t. That’s changing. Bank assets in the Russian banking system grew by 16% during the first three quarters of 2003 alone. Individual deposits in the Russian banking system now top the $50 billion mark. Foreign houses such as Raiffeisen and Citibank are playing their part, to be sure, but as Stephan Dertnig, head of the Moscow office of Boston Consulting Group, points out, an average return on equity of 20% provides more than adequate incentive—and resources—for domestic capital formation. Take Alfa, Global Finance’s pick as best retail bank in Russia (see Stars of the New Russia, page 20). The bank has opened a score of Alfa Express branches—state-of-the-art, automated outlets catering to high-end customers in Moscow. The bank doubled its retail assets in the past year to over $1.3 billion and aims to keep that momentum going. In February Alfa appointed Petr Smida, a Czech national formerly at GE Consumer Finance in the US. This year it aims to roll out 20 more Alfa Express outlets, expanding to St. Petersburg and other regional cities. That move reflects the way in which a wealthy bourgeoisie is springing up across the CIS. There’s certainly a hunger for consumer finance. Consulting groups Expert MA and ROMIR-Monitoring Research Group conduct a regular survey called Lifestyles of the Middle Class. The late-2003 survey confirmed previous trends: As Russians get wealthier, they tend to borrow more. According to the survey, one in four major household goods purchases was done on credit, and 24% of middle-class Russians surveyed said they intended to use credit in 2004. For a brief moment in 2002 and 2003 it seemed that politics and business had come to an agreement to part on good terms. No longer, because, in many ways, it is back to the future in Russia.Take the spat over Vimpelcom, the country’s largest cell phone operator. In February the federal prosecutor’s office announced an investigation into the company’s right to operate in the Moscow region—the densest and richest chunk of the Russian mobile market. The public grounds for the action: the necessary GSM license is actually held by KB Impuls, a subsidiary, and not Vimpelcom itself. Everyone else believes the real reason for the legal onslaught is that key Vimpelcom shareholder the Alfa Group has bought a blocking stake in Megafon, a rival with close ties to the Telecommunications Ministry. Megafon is itself the subject of a fierce battle for control: A Bermuda-based fund believed to be linked to the Telecoms Ministry is fighting Alfa for its stake. If it wins, that means that 61% of Megafon will be controlled by linked parties, making 35.6% holder TeliaSonera a minority shareholder. The prosecutor’s case against Vimpelcom was eventually thrown out in mid-February. In the same month telecoms minister Leonid Reiman was demoted. That may have provided Alfa with a breathing space, but it’s unlikely to be the last incident of its type.The Vimpelcom battle shows that keeping out of politics is no guarantee that politics won’t come seeking you. Beneath the hydrocarbon headlines, it’s those kinds of deals that are—at the edges at least—reshaping parts of the Russian economy. There are good reasons for that. Christof Ruehl, chief economist at the World Bank in Moscow, points out that most successful investments in Russia, whether by Russians or foreigners, tend to be in everyday goods with relatively little technology transfer. And private equity firms are less likely to be frightened off by the recent maneuverings between the Kremlin and the oligarchs:They’ve stared Russian businessmen in the face for some time now.They are also scouting different territory, leaving the oligarchs, the politically connected and the braver multinationals to fight over Russia’s natural resources and manufacturing heritage. But some foreign companies are still willing to tread in politically sensitive territory. Earlier this year Italy’s Enel and Finland’s Fortum led a consortium that put in a bid for managing a power plant for domestic energy monopoly UES. Other out-of-towners pulled out—France’s EDF and Germany’s RWE didn’t like what they saw in the contract’s small print—but the willingness of at least two foreign blue chips to forge ahead was a mark of faith in the reform process that has engulfed UES for years. Later this year UES is set finally to be broken up into 24 regional power-generating companies—a big advance on the fractured system of the current 72 small power companies. Fedor Tregubenko, an analyst at brokerage Brunswick UBS, argues that the emergence of large strategic shareholding groups in UES, together with the nomination of reform-minded CEO Anatoly Chubais and former head of the presidential administration Alexander Voloshin to the UES board, means that the restructuring will continue, but at a slower pace. It is not just banks and consumer finance companies that are benefiting from the power of the Russian pocketbook. Take Perekriostok, Russia’s secondlargest retailer. The company has recently put out feelers to institutional investors, aiming to obtain an overseas listing sometime over the next couple of years. With turnover set to double by 2004, Perekriostok is riding a buying boom that has pushed retail sales up by almost one quarter in 2003 alone. The company, following a now increasingly well-trod path of obtaining funding from first the European Bank for Reconstruction and Development and then fund manager Templeton, seems more likely to choose the London than the New York route. If Perekriostok chooses a London listing, it will be confirming a trend. Once they’ve decided to list their companies overseas, Russian executives typically jumped on a flight to New York. Now, it’s not that simple a choice. Potential criminal sanctions under the United State’s Sarbanes-Oxley Act have deterred some would-be listers, say observers. London listing requirements, while firm, are not so exacting, they say. United Heavy Machinery (OMZ), the metals and engineering combine being refashioned by Kakha Bendukidze, listed on London in September. A steady stream of Russian companies are gauging prospects for a London listing. Among the highest-profile: RusAl, the metals company once owned by Roman Abramovich. The company produces 75% of Russia’s aluminum and 10% of the worldwide total. With demand pushing prices sky high, the company is busy putting on new capacity. A new smelter at the massive Sayanagorsk site in West Siberia is the first new plant to be built in Russia in 15 years, according to new CEO Alexander Boulygine. He points out that the company is not short of cash for new plant: In 2003 it raised two loans on fine terms from foreign banks. The company still plans to float 25% of the stock on London around 2007, though the date could be changed if circumstances alter. Abramovich now owns just 25% of RusAl stock, with fellow oligarch Oleg Deripaska holding 75%. A listing would allow some of those stakes to be cashed in. The Abramovich connection underlines another factor that underpins the London option: its attraction as a location for Russia’s restless elite. Since selling most of his Russian assets, Abramovich has moved lock, stock and barrel to London, owning a townhouse in London’s glitzy Eaton Square and a country estate in leafy Sussex. Now owner of the fashionable Chelsea soccer club, Abramovich rates as the United Kingdom’s richest man. Few would claim that listing decisions are made on lifestyle grounds alone, but there’s little doubt that London’s congenial atmosphere does it no harm in the competition for Russian listings.